This much is clear: The 25th analytica is going to be more international than ever. As of right now, the number of exhibitors from countries other than Germany that have registered for the fair is up by 27 percent over two years ago. The United States accounts for a large share of that increase (32 percent). So far 789 companies have confirmed their participation (compared to 727 in 2013). That is an increase of 8.5 percent. 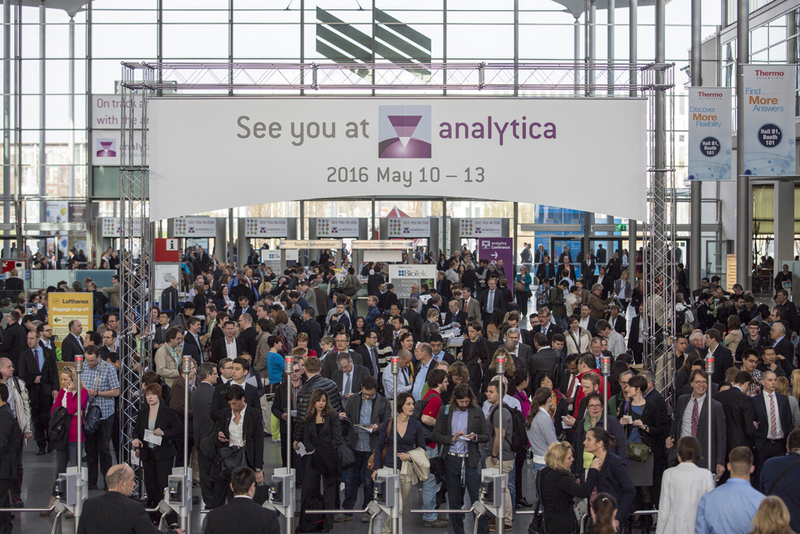 analytica takes place in Munich from May 10–13, 2016. Susanne Grödl, Exhibition Director of analytica: “Given these numbers, there is no question that analytica is the gathering for the international laboratory technology, analysis and biotechnology industry.” The share of international exhibitors is currently 49 percent. Besides the increase in exhibitors from the United States, the number of companies from Italy is up by 30 percent. China will have three large joint exhibition stands at the fair, and India will have one joint exhibit. Once again, the industry’s main event will bring leading German and international manufacturers to Munich again in 2016. In the laboratory technology sector, major laboratory furniture manufacturers such as Köttermann and Waldner will be joined by other companies such as Asecos and Düperthal. Bruker, Büchi, Carl Zeiss Jena, Deutsche Metrohm, Mettler Toledo Merck Millipore, Netzsch Gerätebau, Shimadzu, Thermo and Waters will present solutions in the analysis and quality-control sector. The manufacturers and research organizations representing the biotech and diagnostics industry in Hall A3 will include Becton Dickison, Sartorius and Germany’s largest biotech cluster, i.e. Bayern Innovativ. International flair will also be noticeable at the analytica conference, the fair’s scientific highlight. Renowned researchers from around the world will speak about analysis trends in chemistry and the life sciences. Among other things, this year’s program will include sessions titled “Separation techniques: How many dimensions are enough?”, “Analytical challenges from implementing consumer-oriented legislation”, “Lab-on-chip technologies” and “Disruptive imaging technologies.” The conference is organized by Forum Analytik—an alliance of Germany’s three leading scientific associations, i.e. the German Chemical Society (GDCh), the Society for Biochemistry and Molecular Biology (GBM) and the German Society for Clinical Chemistry and Laboratory Medicine (DGKL). The fair also features a number of related events that deal with issues from everyday laboratory practice. In 2014, the special show on occupational safety and health and safety in the workplace was a popular attraction from the very beginning and was attended by more than 4,000 visitors: 97 percent of those visitors gave it a rating of good to excellent. There is no question that it will be part of the program of events again in 2016. In addition, visitors can also look forward to the Live Labs, the analytica forums with tips for actual practice, the theme day on personalized medicine and Finance Day. Once again, Klinker & Partner are organizing a training program for those with a thirst for knowledge. And on Friday, future industry professionals can find out what the industry of the future has to offer at analytica Job Day and Student Day.